In March, we wrote about the growing threat of yellow fever in Brazil. At the time, the disease had killed just over a 100 people. Unfortunately, the disease has only spread since then with many more people infected and more killed. 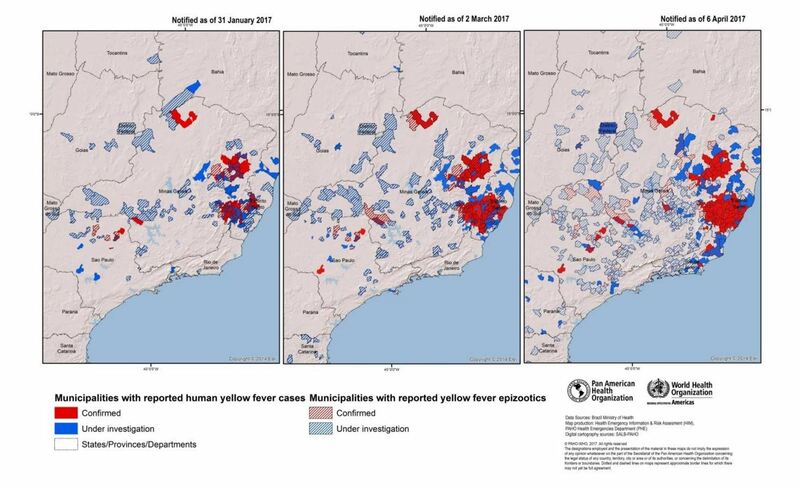 The Pan American Health Organization (PHO) and the World Health Organization (WHO) released a report April 10 on the state of yellow fever in Brazil. According to their findings, collected between December 2016 and April 6, 2017, there have been 604 confirmed cases of yellow fever, with 552 additional cases currently under investigation. 202 people have been confirmed dead, with an additional 48 under investigation. The report claims Aedes aegypti, or the yellow fever mosquito, have not contributed to the current outbreak. These mosquitos are typically found in cities, while the mosquitos blamed for spreading yellow fever, in this case, are mostly found in forests. While the city-borne mosquitos have not been involved yet, they pose a risk to the dense cities they reside in, such as Vitoría or Salvador, according to the PHO/WHO report. A team of Brazilian researchers has also looked at monkeys as contributors to the outbreak, as certain species such as the southern brown howler have been known to spread yellow fever. So far, there have been 474 confirmed infected primates, and an additional 997 primates continue to be investigated. Based on their findings, and the current situation, these health organizations have recommended vaccination as the best way to approach the outbreak. The yellow fever vaccine has a 99% effective rate in fighting the disease. The challenge though is that there is currently a high shortage of the vaccine. Dr. Anthony Fauci, the director of the National Institute of Allergy and Infectious Diseases, said that more can be made, but that it will take time. If the vaccines can be produced and effectively spread to the Brazilian population, it would not only help to stop the outbreak but also prevent the virus from spreading throughout the continent. Updated at 6:51 p.m.: The Centers for Disease Control and Prevention (CDC) has expanded the areas in which they advise travelers to be vaccinated for yellow fever before visiting. A full updated listing can be found here. It is recommended that for those traveling to Brazil, they receive their vaccination at least ten days before their visit.